With two incarnations of the Doctor, a superb regeneration scene and some emotional moments, 'Twice Upon A Time' was only let down by its lacking plot. Christmas usually means one of two things if you’re a fan of Doctor Who. Either you’re going to be confronted with a below-par, frustratingly tailored-to-the-season special, or it’s the end of an era and the famous Time Lord is about to regenerate once again. Twice Upon A Time is no different, and perhaps by virtue of falling into the latter category, it’s well worth a watch and sets up the start of Chris Chibnall’s era at the helm of the show in suitable fashion. It’s ironic that in Steven Moffat’s final outing as both the lead writer and showrunner of the world-famous show, the episode has a rare sense of purpose, in this case a spiritual journey for first and twelfth incarnation of the Time Lord. However, that in itself proves frustrating, as yet another fascinating concept devised by Moffat goes under-used. This time, it’s the turn of the ‘Testimony’ – a university-funded sentient computer programme on New Earth that extracts people through time at the point of death to preserve their memories and console the living – the ultimate take on the ‘message in a bottle’ concept. But that’s not Doctor Who. It’s almost a given that any regeneration episode will feature an amount of nostalgia or sentiment, but any actual plot is sacrificed in order to facilitate an emotional journey. There’s no villain, no threat, very little mystery, and nothing much doing in terms of suspense, intrigue or high stakes. In short, it’s Doctor Who without the formula that makes it successful – the Doctor even concedes at one point that he “doesn’t know what to do” when it’s not an evil plan stretching out ahead of him. 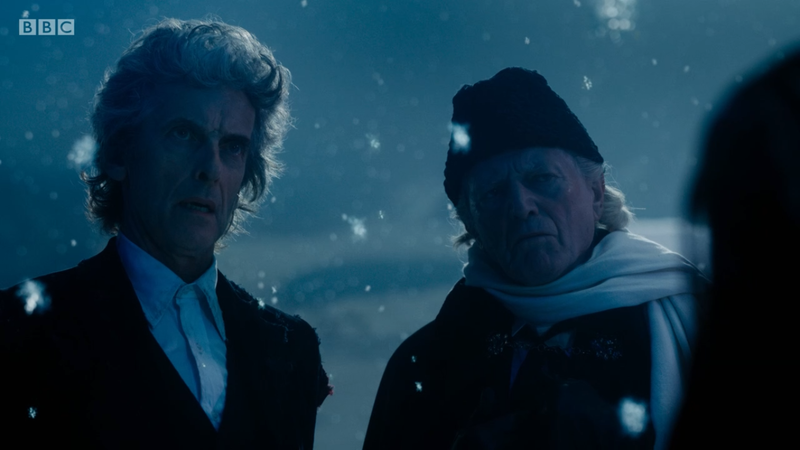 The cast largely paper over the cracks in Moffat’s writing on this occasion, with exceptional on-screen chemistry between Capaldi and David Bradley, despite the fact their incarnations of the Doctor are arguably the most similar ahead of David Tennant and Matt Smith, and the more than welcome return of Pearl Mackie livens up proceedings, adding humour, attitude and that winning charm to some of the less active sequences. The biggest compliment that can be paid to Mark Gattiss is that Twice Upon A Time forced me to consider whether he’s been unfairly criticised during his time with Who – he remains a solid actor and perhaps his writing credits are simply the result of a poor allocation in the writer’s room. The nod to the long-serving Brigadier Lethbridge-Stewart is welcome, and a fitting way to tie the two Doctors together. Playing with time has always been hit-and-miss as far as Moffat is concerned, but on this occasion he ties together the past, present and future rather fittingly. Visually, the episode checks out against most of it’s contemporaries – the Testimony look a little too ‘standard sci-fi gooey looking’ for me, but they certainly don’t look silly or out of place. The First Doctor’s set has been re-created wonderfully for it’s brief appearance, and – spoiler alert – the Twelfth’s seemingly destroyed equally as well in the climatic final regeneration sequence. The return of Murray Gold’s scores from series’ past adds an extra lift to proceedings, in particular a short extract from ‘Vale Decem’, last heard as the 10th Doctor bid an emotional farewell above the Earth back on New Years Day in 2010. A word for Jodie Whittaker, too. Much has been made of her appointment to the eponymous role of this world-famous show, and I’d like to point out first and foremost that the opening scene of any Doctor’s tenure usually divides opinion, reveals little and is pretty much out of place with everything that follows – anybody remember the cringe-worthy shivers that some felt when Tennant, perhaps the most popular incarnation, grinned and produced the word ‘Barcelona’? Her introductory scene was well-handled, visually and audibly very impressive and she already comes across as part of the furniture. Off the back of it, I’m genuinely looking forward to watching her grow into the part, as each of her predecessors has done. If you found yourself trapped in a Time Eddy and missed the episode, ‘Twice Upon A Time’ is now available on BBC iPlayer. Damian is a final-year History student, part-time motorsport media professional and a lover of films and stand-up comedy.